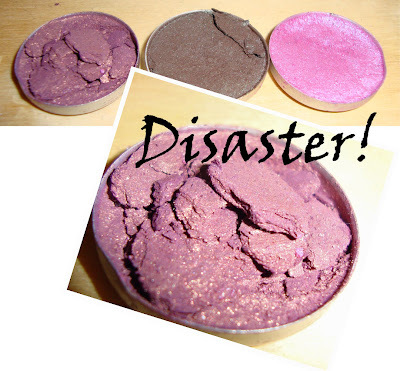 B U B B L E G A R M: How to fix your broken eyeshadow! whatttt, that is so cool, I didn't know they could be fixed! 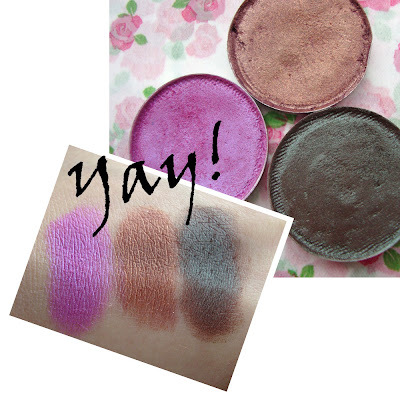 And they turned out really well, kudos for not giving up on your eyeshadows. thanks for sharing the tip! we have all been there hahha. Thanks so much for this! I haven't broken any shadows yet (Knock on wood)! But if I do, then I can use this method! Isn't this kind of similar to pressing pigments? yay for pictures! i have no time to watch videos, so your pics were so helpful. by the way, LOVE the purple shadow, looks like a nice shade of violet. I've watched this vid by Kandee, it was really helpful and I saved 3 eyeshadows that I would normally throw away. Haha for some reason your Stars N Rockets looks WAY more vibrant than mine! Ahhh happened to me so many times! luckily no mac shadows..but its a bummer! Mac blushes are harder to fix imo..mine has cracked twice with this method, glad all urs a fixed! I've wanted to use this method to press pigments for ages but haven't got around to it yet..
muhsine, did you have to buy your surgical spirit over the counter in superdrug or was it just on the shelf? I went in the other day and they weren't very helpful! It was so interesting to read your tips- I read them all at once, ha ha! I used to love crafting so much but since I am so busy with work I seem to have lost my creative vein :( your posts inspired me heaps! This was most useful. Just today I went to God-knows-how-many chemists and they've never hear of rubbing alcohol. I've seen surgical spirit, but they said no way I can use it to press e/s as it would burn my eyes! thank you!!! I will get a bottle of this stuff then! I guess Kryolan shadow is different. I just tried this and sadly, it didn't work at all. Made a huge sticky mess, ended up throwing the shadow away. I guess Kryolan is different.